This mix has been a looooong time coming…but it’s finally here! 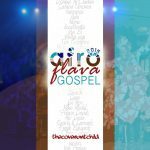 The AFROFLAVA GOSPEL MIXTAPE 2011 is one of my most played & downloaded mixes to date. ‘Only made sense for me to put out the sequel! Enjoy over an hour of unrestricted praise & worship music with an African vibe! Featuring music from Ron Kenoly, Paul Irabor, Frank Edwards, Uche Agu, Israel Houghton, Tye Tribbett, and more!